When the 2018 Delaware County Fair kicks off in September, it will do so with a new company in charge of the rides. Triple Treat Shows of Cincinnati will operate the rides this year after the owners of Bates Amusements, Inc. — the fair’s previous ride operators —announced last year they were leaving the business. 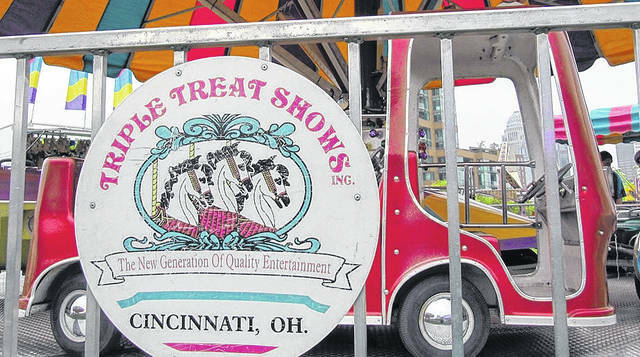 The 2018 Delaware County Fair will feature a new ride company — Triple Treat Shows of Cincinnati. In January 2017, owners of Bates Amusement, Inc. announced they would be exiting the ride business after the 2017 fair season. The Delaware County Fair first hired the Bates Brothers Amusement Company in 1984, which became Bates Amusement when the brothers divided the company. The Delaware County Agricultural Society Board of Directors, which oversees the Delaware County Fair, did not take lightly the importance of choosing a new ride company. Three ride companies made presentations to the board, and each company visited the 2017 fair and met and toured the grounds with directors and the fair manager. In addition, throughout the fair season, board members visited fairs where the three ride companies had their rides. Visits to their maintenance facilities were also a big part of the task of choosing a ride company. Seeing where the companies work on their rides and do the maintenance and upkeep is just as important as the actual rides seen at fairs. After 10 months of due diligence, the board chose Triple Treat Shows to be the ride company for the 2018 Delaware County Fair. It was a very close vote, and all three companies would have served the fair well, but it just came down to who the board felt most comfortable with in regards to both equipment and people. Triple Treat Shows is relatively new (established in 1998), but Jay and Vicki Clements have over 80 years of experience in the carnival industry. Vicki grew up in the carnival business. Her father and grandfather both owned their own amusement companies. By watching how her father and grandfather ran their family owned companies, Vicki gained a great deal of respect for the industry. She also encompassed a savvy business knowledge. A knowledge that can only be gained by hands on experience. Jay has managed rides for large amusement companies for over 30 years. His operational and mechanical skills are matched by no one in the carnival industry. Jay and Vicki’s son, Russell, and his wife are now also a big part of the business, too. Russell also serves on the Board of Trustees for the Greater Ohio Showmen’s Association, helping to safeguard the issues facing the modern-day amusement industry. “We were sad to say goodbye to the Bates family after their long service with the fair, but we are excited to welcome the Clements family and Triple Treat Shows to the 2018 Delaware County Fair,” said Don Howard, current fair board president. The 2018 Delaware County Fair will take place Sept. 15-22. Submitted by the Delaware County Fair.